Pope Francis arrived in Washington, D.C. Tuesday afternoon, beginning a six-day visit in the United States that will include time in D.C., New York and Pennsylvania. While many have expressed excitement over the Pope's first visit to the U.S., the event is not without controversy. On Wednesday afternoon, the Pope took an action that upset many, particularly those among Native American communities. He canonized Junipero Serra, an 18th-century missionary, whom members of the Native American community consider to be a genocidal colonialist whose actions should be renounced, not glorified. Friar Junípero entrusted his missionary activity to the Blessed Virgin Mary. We know that before leaving for California, he wanted to consecrate his life to Our Lady of Guadalupe and to ask her for the grace to open the hearts of the colonizers and indigenous peoples, for the mission he was about to begin. In this prayer we can still see this humble brother kneeling in front of the “Mother of the true God”, the Morenita, who brought her Son to the New World. Francis also called Serra "one of the founding fathers of the United States" and a "special patron of the Hispanic people of the country." Serra was beatified by Pope John Paul II on Sept. 25, 1988, almost 27 years to the day before his canonization. According to The Guardian, Serra has not gone through the complete four-step process for sainthood. To be canonized, a would-be saint typically needs to have two confirmed miracles, and Serra only has one. That one miracle was confirmed in 1987, when a nun in St. Louis prayed to Serra and was subsequently cured of Lupus. Many Native Americans disagree with Pope Francis' assessment of Serra's impact on the state and the country. According to New Perspectives On the West, a series from PBS, Serra and his fellow Franciscan friars who settled in San Diego wiped out indigenous tribes and erased their cultures, in large part by bringing foreign diseases which sickened and killed many Native people. Native Americans were also subject to violent punishments, such as whippings and being placed in shackles, if they disobeyed the Franciscans. However, some in the Hispanic and Latino American communities are supportive of the canonization of Serra, saying that this new saint would highlight the role that Hispanic and Latino leaders have played in the culture of the Catholic church. The Vatican has defended Serra's canonization, saying that records indicate that he in fact acted in favor of Native Americans, and tried to protect them from other, more violent colonizing efforts. 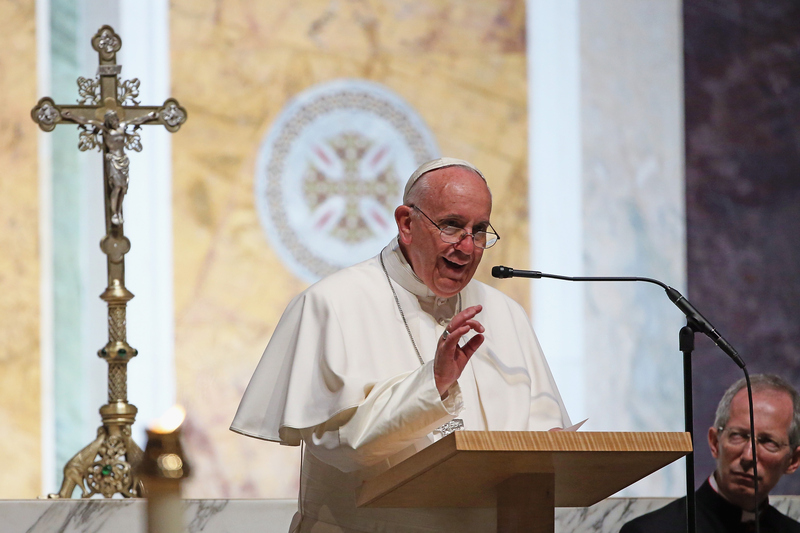 Despite the protests of many who feel that their ancestors and their culture were violated by Serra and his missionary work, the Pope made Serra the first-ever saint to be canonized on U.S. soil.